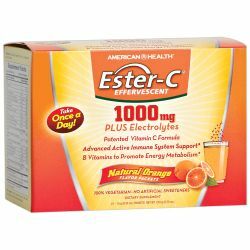 Ester-C��Effervescent Vitamin C Packets offer powerful nutrition in a delicious, natural orange flavored formula. Just take one packet daily with 4-6 fl. oz. of water and you are good to go! Patented Ester-C� increases levels of Vitamin C in the body - getting into white blood cells, an important part of your immune system. And, because Ester-C� absorbs into your system and stays there�you get 24-hour immune support...so once a day is all you need. Taken once a day, Ester-C� has your immune health covered. It supports circulation, is beneficial to joints and connective tissues, helps reduce the premature aging of cells, and forms the basis for healthy skin. Helping to neutralize free radicals, Ester-C� also aids in the nutritional absorption of iron and works with other nutrients to promote overall health. Along with essential vitamins, such as B-6 and B-12 to promote energy metabolism and vital electrolytes to aid in metabolic hydration, Ester-C� Effervescent Formula has got you covered. Now more than ever, trust your immune health to Ester-C�.